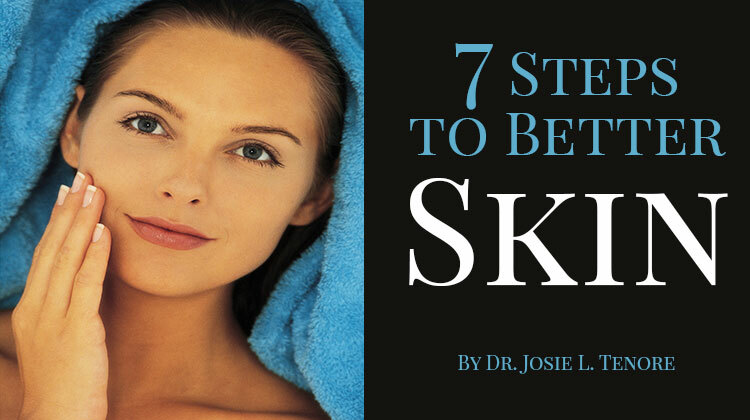 If you want younger, healthier looking skin, you need to put in some effort. While Botox can smooth out fine lines and wrinkles, and injections do “fill in some of the holes,” these quick fixes do nothing to reverse the effects of aging and the environment. To achieve long-term results, you need to take steps to protect, clean and treat your skin both at home and with the help of a qualified physician who will help you choose the products and treatments that are best for you. Protect your skin inside and out. A healthy diet heavy in fresh vegetables, fruit and lean protein is as important as avoiding smoking, alcohol and excessive ultraviolet radiation. Most people are probably aware that exposure to UV radiation from either the sun or tanning devices can lead to skin cancer, but some might be surprised to learn that exposure also has been linked to cataracts, premature aging and immune suppression. There’s a reason why fever blisters or cold sores develop so quickly after sun exposure—the depressed immune system allows the virus to come out of hiding. The American Academy of Dermatology emphasizes, “There is no scientifically proven safe threshold for exposure to the sun or indoor tanning devices.” The AAD recommends that everyone use a broad-spectrum sunscreen that protects skin from both UVA and UVB rays. For optimal protection, these products should have a sun protection factor (SPF) of at least 30, be water resistant and be reapplied every two hours. Sunscreen should be part of everyone’s daily regimen, and not restricted to just summer months or sunny environments. When practical, wearing long sleeves, pants, a wide-brimmed hat and sunglasses also can help. In addition, it’s important to avoid the sun during peak times of the day by letting your shadow be your guide. When your shadow is shorter than you are, it’s time to get in the shade. Finally, if you want additional protection, lather up with products containing Vitamin C and E before applying sunscreen. Remove anything from your hair, skin or nails that require special products other than a cleanser. This may include make-up, medicated balm, nail polish or even tape adhesive. The idea is to remove these products first so that the cleaning agent can do a more thorough job with less product. Wash with a product selected especially for your skin type and degree of bacteria. A great product to help with cleaning is the Clarisonic ultrasound device. It does a better job with much less trauma to the skin than other methods. This is due to both the ultrasound action and a built-in two-minute timer that ensures that you do not short change this process. Use a toner to ensure that skin products can do their job. Every cell in our bodies has a certain level of acid or base in its chemical makeup. Toner alters the acid level of the skin so that products penetrate the skin barrier better. This allows for the repairing or corrective products to get to where they need to be. Apply products that will make your skin healthier. There are many ingredients that help correct the skin. These can be peptides, vitamin C or hydroquinone, to name a few. See a qualified physician for a complexion analysis that will determine what corrective products you will need. Take steps to stimulate your skin. When we are young, the layers of the epidermis are constantly being formed and shed. As we get older, this process slows down, leaving us with a dull, flat looking appearance. Products that help stimulate these layers include alpha-hydroxy acids, growth factors and vitamin A. Procedures performed at a physician’s office can help reverse skin damage and the signs of aging. A Standford University study showed that Broadband Light (BBL) treatments turn on the genes that create younger-looking skin. These treatments should be performed at least twice a year, but the more UV damage, wrinkles or looser skin, the more treatments you will need. For optimal results, supplement the BBL treatments with monthly chemical exfoliation and microdermabrasion or microneedling.